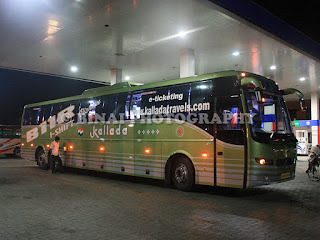 Bangalore to Thrissur: In Kallada's newest B11R! This visit - the fourth in the month of May - was to attend my cousin's wedding. The function was on Saturday, and my initial plan was to reach there on Saturday morning. There were some functions the previous night - and I was in dilemma to attend the functions or not. The thoughts kept racking my mind for quite some time. I had booked my return ticket a month in advance itself - for the simple reason that it was the last Sunday of May, and the end of the summer vacations - so it was a risk waiting till late to get a ticket. But I hadn't booked my outbound due to the confusions. I somehow decided to take a leave on Friday as well, and leave on Thursday night. I thought it would be easy to get tickets - but I was wrong! Almost all buses were sold out, and the remaining ones had seats at the back. I was half-minded about booking in Kallada's Kodungallur bus - but the seats were at the back. I hadn't finalised any bus. A contact in Kallada messaged me that their new B11R had been delivered, and is running in the Hyderabad-Ernakulam route - but the website kept showing all schedules to be B9Rs. A friend confirmed spotting a B11R in Hyderabad. I confirmed the details, and booked a ticket in Kallada's Hyderabad-Bangalore 1st Service - boarding at Kalasipalya. I had lots of time to go for my bus. I booked a cab through OlaCabs, online. I wanted to try their service since long, and this was a chance. I got a confirmation message almost immediately, and I kept checking their website for the status of my cab. I had scheduled a pick-up at 2230hrs. I had light dinner at home, and then sat down checking the website. At about 2130hrs, the status turned from "Scheduled" to "Allotted", and almost immediately I got an SMS with the details of the cab. I received a call from the driver asking the route to get to my place. The cab reached my place at around 2215hrs (I was alerted of his arrival by means of an SMS from OlaCabs!). I confirmed the arrival by calling up the driver. I left home at around 2220hrs. It was an Indigo (I had booked for an Indica) - a well maintained one. The driver was very sedate - actually a very good driver. He slowly went through Marigowda Road, reached Minerva, went straight from there, and finally dropped me right outside the Kallada office in Kalasipalya, at about 2250hrs - the fare came to Rs. 202 - now that was quite economical! I still had about 50 minutes to go for the reporting time itself! I roamed around the almost empty Tippu Sultan Palace Road (TSP Road), the nerve-centre of private operators. There were some KPN B9Rs lined up for departure at one end, and a similar line of SRS B9Rs at the other end. I stocked up some snack items from a store there and then headed to the Kallada office. I showed my ticket, and he said the bus would come at 0030hrs. Had a rather long chat with him, and found that the normal timing of the bus is 0030hrs, but they've put 2355 on the website to avoid date confusions among passengers. He went on to describe some situations were passengers ended up missing the bus due to date confusion - he said the condition was worse for the next schedule (0230hrs from Bangalore), where passengers ofter thought 0230 was in the afternoon! Those confusions were understandable - I am always scared of these midnight departures, solely for the date part. There were lots of passengers waiting for these late night buses at the Kalasipalya office. I was surprised to know that this particular office functions 24 hours - in fact, the whole of Kalasipalya was sleeping at that hour - not a single travel office was opened. I spent most of the time sitting in the office itself - I was sleepy all the time, as well. I was casually glancing through the chart for the Hyderabad-Ernakulam service (my bus) - I was actually shocked to see that the bus had over 30 passengers booked through from Hyderabad to Kerala! Something else caught my eyes - My seat and the adjoining seat was marked as "ladies" seats!! I was now worried if my co-passenger would be a lady - that would create helluva commotion in the bus. I was worried if my jinx with S.Kallada was continuing. I was down. I asked the guy at the counter to open the master chart - he did, and that too showed the seat to be marked for ladies. Ohh! My! Will this be a terrible ride? The guy at the counter checked if there were any empty seats - there were none - we were running a load of 52/52! In the meantime, the people in the office were continuously in contact with the crew of both the HYD-EKM and the EKM-HYD buses. On bus was near Mekhri Circle then, and the other near Electronic City! My bus came in at 0040hrs. I was happy and surprised to see Joby at the wheels - he is the same chap would worked the inaugural trip of Kallada's first B11R - I was confident of his capabilities! So I am in for a rocking ride. Now the next tension - the seat. I walked the length of the bus to reach my seat, J1 - my co-passenger too was a "fe"Male! I was now relieved. Squeezed into my seat, and settled down for the long ride. The bus started off at 0043hrs - a quick 3 minute stop to let passengers alight and new passengers join! If only Kallada showed this efficiency at all their offices. The bus was on the main road in no time - this B11R appeared more refined and silent compared to my previous rides. We had a brief halt outside Lalbagh (reasons unknown) - it lasted about 4-5 minutes. We stopped at Madiwala to drop a passenger (0058hrs), and then continued. I remember the bus going below BETL - I slept off even before we reached Attibelle! That was one really nice sleep - no disturbances, and I am sure there was no rash driving - since I am very sensitive to driving habits. I have no idea if they honked at night - since I was almost at the back of the bus. I woke up at around 0435hrs, when the bus had stopped to drop someone - we were already in Perundurai! The bus slowly crawled into the "No.1 Air" Pump - at 0438hrs. It was then a crowd to get off the bus - almost everyone in the bus wanted to get off and use the washrooms. We were joined by a KL registered B9R of Kallada as well. The bus: KA-01-AC-4548, at the Perundurai pump. A lot of tea/coffee vendors had flocked around the bus now - and a lot of passengers patronised them. I went about snapping a lot of pics of the bus. The crew were busy in the refueling process, while the Kallada staff posted at the pump went about verifying the passenger manifest (and cross checking it) and also noting down details like odometer reading, fuel consumed, etc. The break was quite long - we started off only at 0452hrs. I was not very confident of the bus reaching Thrissur on time now, but it was Joby at the wheels now. I dozed off by the time the bus reached back on the highway. Another good sleep, only to be woken when the bus hit some potholes at the beginning of Coimbatore bypass. The bus stopped at the Neelambur office of Kallada, at 0554hrs. The pick-up van was already waiting there. Very few passengers got down here (around 6 of them), and we started off again at 0557hrs - another stellar performance from Kallada. The bus was maintaining pace throughout the bypass, and we passed Walayar at around 0644hrs. We did not stop there (or did we?). We finally stopped at Palakkad bypass, at 0705hrs - a quick stop, and we started off again at 0707hrs. Now comes the show from Joby. He was at ease driving the 14.5M monster - he kept overtaking slow moving vehicles at a constant pace, and showed all his skills handling the monster as he kept maintaining pace. I was surprised seeing the pace with which works were progressing in the Walayar-Vadakkencherry section - a lot of sections were already levelled and culverts were coming up at a good pace. We passed Vadakkencherry at 0736hrs. Then came the show of power on Kuthiran - he was on the right lane most of the time, but none of the maneuvers were scary! This was the first time I enjoyed someone's driving so well. Now I was re-assured that we'd be in Thrissur at the promised time. I headed to the cabin after we passed Pattikad. Joby was loving the drive, as he joyously kept overtaking even now! I had a longish chat with him - he seems to love driving the B11R over the B9R. He is the only driver in Kallada to have undergone driver training for Volvo B9R, B11R as well as Mercedes tri-axle! His training showed - he used all the functionalities in the bus. As we neared Mannuthy, it started raining a bit. Joby immediately switched on the speed alarm and modified retarder power. We pulled into Mannuthy Kallada office at 0817hrs - a good 13 minutes before scheduled time! Kallada provides a pick-up van for passengers going to the town. I bid adieu to Joby, and walked towards the office. The office guy was waiting outside the office - he quickly grouped passengers heading to the town, and sent us in autorickshaws. The driver was instructed to get the fare from the Sakthan Nagar office of Kallada. I was dropped outside Sakthan Nagar Municipal Bus stand, exactly at 0830hrs - the scheduled arrival time at Mannuthy!! It was then a KeSRTC ride to reach home. End Notes: The bus, KA-01-AC-4548, had only about 5700kms on the odo. The bus smelled fresh even as it completed almost a week of running (the bus was delivered on May 17, 2013). Carpet was still not installed. Some seats still had plastic covers on it. The bus kept time throughout. The end-to-end run took only 7h34m - a record for Kallada, sure. Both the drivers were excellent – Joby deserves an exclusive appreciation. I was bowled over by Kallada this time, ending my jinx of bad experiences with them. I loved the service – and sure to repeat it again. Will I take this service again? Surely! I loved the timings, and the service. This bus does not have a pick up at Madiwala-due to late hours? Well do you know anything about the procedure of carrying bikes to BLR in these buses-and fare? Also any guess about RTO formalities for a KL Vehicle? No pick-up at Madiwala due to late hours. But I guess you can call up and ask to be picked up there. TO carry bikes, please get in touch with the nearest travel agent, preferably the main agent of your area. Original RC book should be carried along. The rate is normally, the fare of one ticket. I am so glad that, you judge drivers skills authentically. Probably the only (?) travel blogger who's even bothered of unwanted honking. Please do convey a word of appreciation to such good drivers directly, if possible in presence of their colleagues and fellow men. Am sure, this will motivate them. I dream of a day, we all recognize good driving is not just speeding and honking.! My first: Kallada's Volvo B9R Sleeper!